Well, the last part of the journey was not really uneventful. Traffic in Malta seems absolutely insane – on narrow, winding roads dusty cars seem to come out of nowhere. I tried to figure out what traffic rules were like in Malta, but from within the bus I could not distil anything that could pass for a rule that made sense to me. To make matters worse, the bus driver almost got us into an accident twice. I arrived at the Corner Hostel in the town of Sliema a bit sweaty, as you may understand. I made it all the way to the Portomaso Marina, where some of the wealthier people have a pied-à-terre, with their huge yachts floating close by. I struck up a conversation with an old, local fisherman. He told me about the harbour, where he had lived for decades, before the new apartment complex was erected and he was forced to leave. According to him things seemed serenely now for the sea breams, but that this may change really quickly if, as sometimes happens, vicious barracudas decide to pay the harbour a visit during twilight. 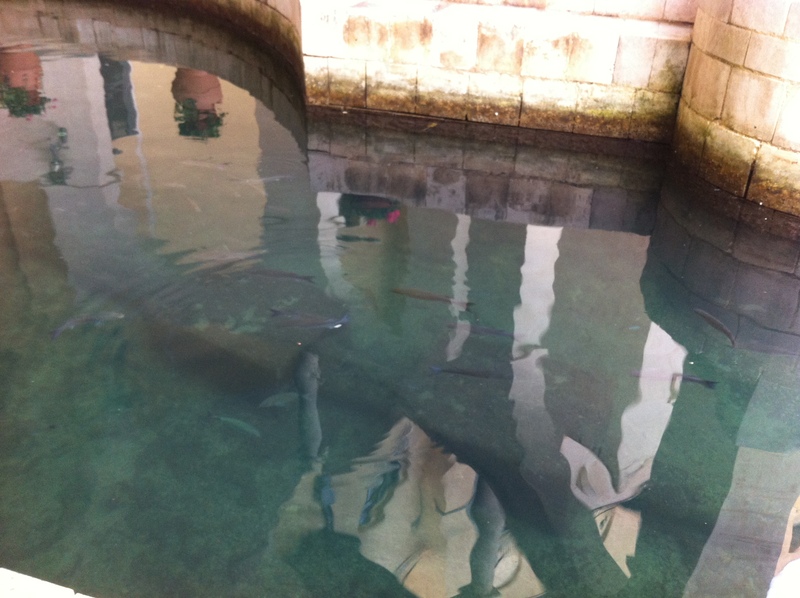 I’ve had a shark phobia since before I remember – but those barracudas are truly scary! On the way back I had some mixed seafood (yummy!) 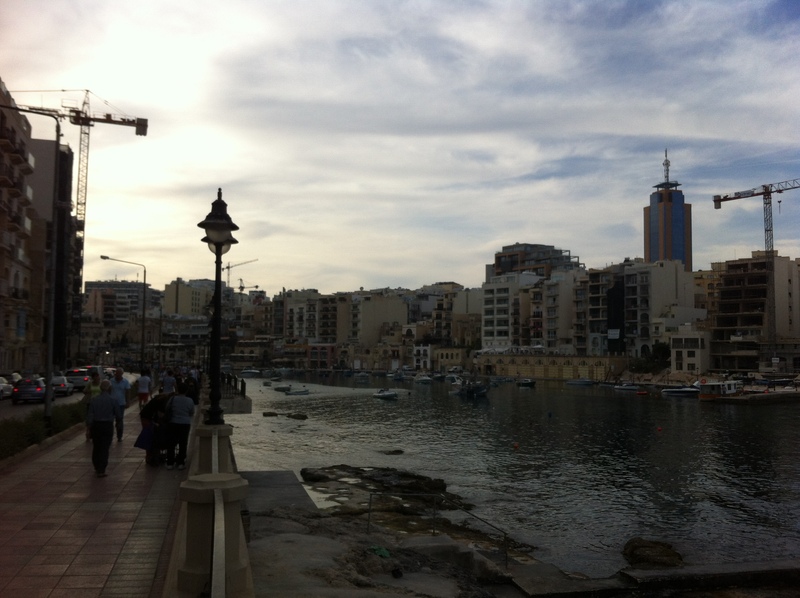 on the seaside, and I enjoyed the vistas along the Spinola and Balluta Bay once more. The other day, I started the day with a long run, before the sun would get too high. I ran to St. Julians, along the route that I had walked the day before, and made a U-turn there. 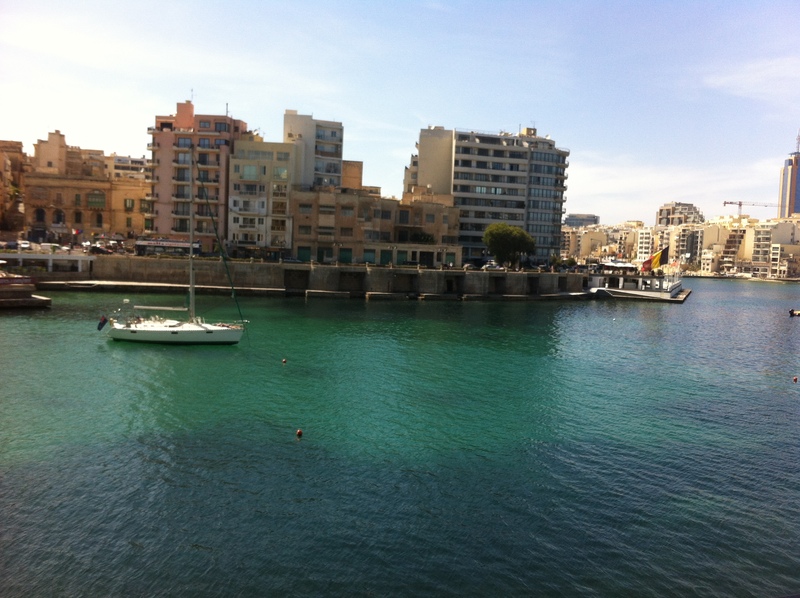 I ran along the coastline, all the way to Manoel Island, and then back to the hostel. After a hot shower, I went out and got breakfast: fresh fruit and bread, right out the oven. 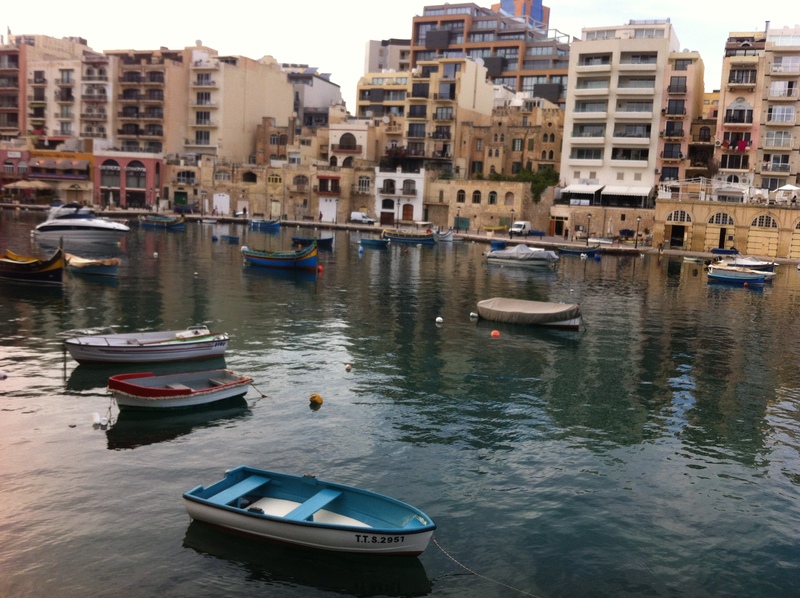 I took it to the ‘beach’ (Sliema and St. Julian’s – and most of Malta, actually – don’t have sandy beaches but rocky outcrops that stretch into the sea), where I ate with my tired feet dangling in the Mediterranean Sea. Of course, I accidentally dropped a bit of my bread in the sea. The spectacle that unfolded before my eyes was nothing short of amazing. Within 30 seconds, dozens of tiny little fish were thronged around the little piece of bread. Less than 30 seconds later these little fish all at once jumped out of the water, fleeing the scene. Little fish attract bigger fish – what a spectacle! Having finished my breakfast, I took a bus to the picturesque town of Naxxar, to visit the Palazzo Parisio, an 18th century palace. Unfortunately, I could not visit the palace itself, because a wedding was about to take place. I could and did still take a stroll through the surrounding gardens, which are nice (especially the turtle pond in the very centre) but perhaps not worth the 45 minute bus trip from Sliema. I managed to catch a glimpse of the wedding preparations – the place really looked delightful. Being in a position to, soon, having to think about organising a wedding myself, I asked for some information. I quickly received an invitation for a private tour of the palace later this week – perhaps I can get Sarah to consider it! After a decent lunch in Naxxar, I took a bus back to Sliema. I bought goggles and sped to the beach – it had been long enough, I had to join those fishes! The water seemed cold at first, but wasn’t really. 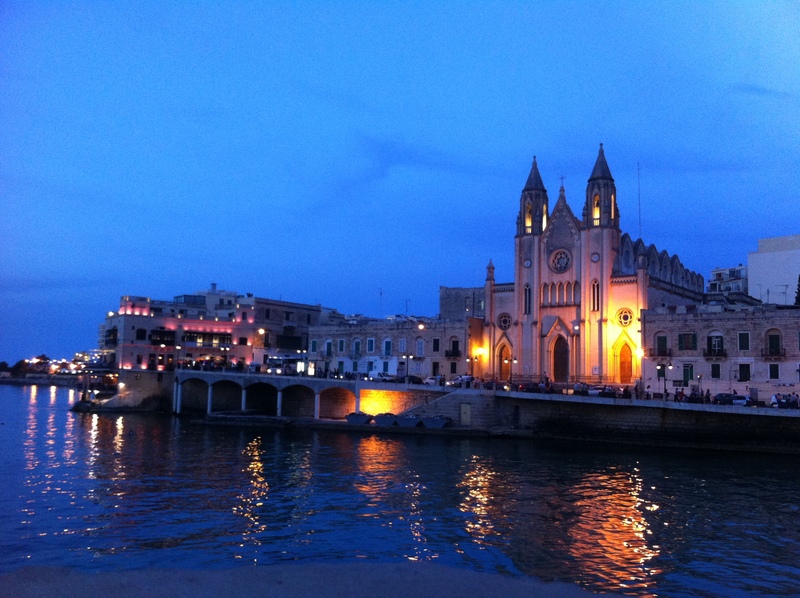 The Maltese waters host a large variety of fish and underwater fauna, as I would soon find out. I saw hundreds of fish, from a huge school of sardines to medium-sized comber and wrasse, and pretty big sea breams, but also little crabs, sea urchin, and massive rag worms. Seeing all those fit Maltese people (they really seem to be fit – everyone that’s not, is a tourist from either England or the Netherlands, or so it seems), I decided I had to go for another run. So far, staying on Malta seems to be pretty healthy for me – I eat way healthier than I usually do, and I exercise more as well. At night I went out for dinner (Bragioli, typically Maltese beef rolls) and drinks, after which I returned to the hostel, where I wrote the above. Strolling through traditional cities and towns, and their gardens, squares, churches, and whatever more they have to offer, interrupted by a casual conversation with locals, and while completely losing track of time – definitely my favourite pastime. Combined with gorgeous weather and fresh food, I can feel my batteries recharging after weeks of intense work. Somehow, it feels I get cleaner or lighter every hour, every day. 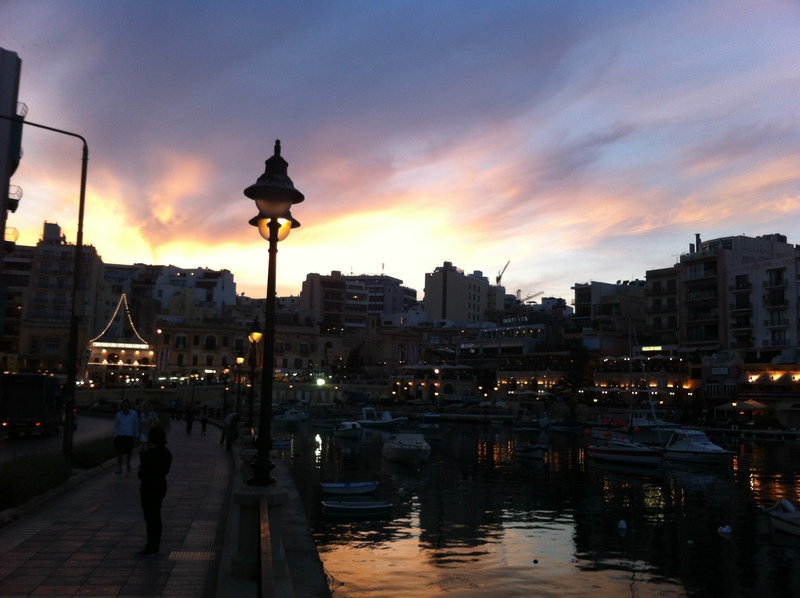 Well, a little over a day has passed, and so far visiting Malta has been a huge success. Tomorrow I will go to the airport and pick up my fiancée after two months of being apart again – things are getting better by the day! 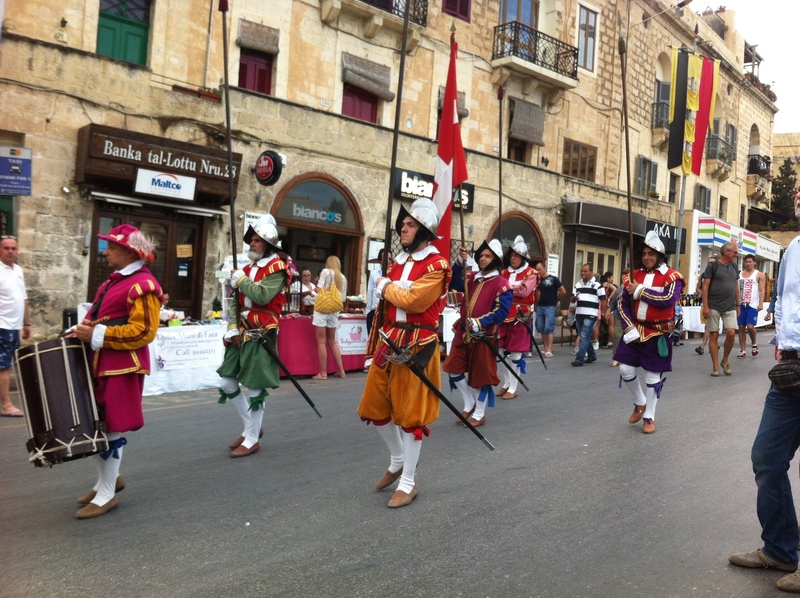 This entry was posted in Travels and Trips and tagged holiday, Malta, Sliema, St. Julian's, travelling, trips.